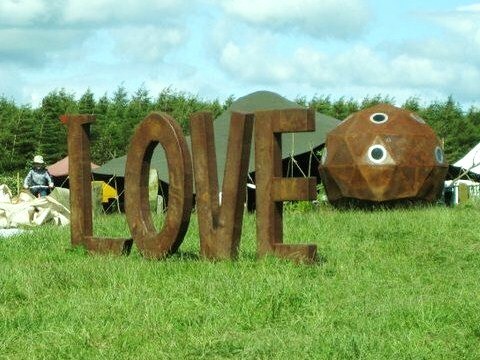 Solar-Powered Festival Venue & much, much more! We refuse to compromise for an easy life or a cheap deal. Where most companies put profit, we put ethics - right at the heart of what we do. We use solar powered energy efficient tech whenever possible and always LED lights. We reuse, recycle and compost as much as we possibly can. We use biodegradable binbags, eco cleaning products, recycled aluminium foil, everlasting coffee filters, unbleached teabags, paper straws, edible cocktail decorations and recycled paper. We avoid using disposables, right down to cutting up old towels for cloths. We buy and sell only vegetarian foods and over 90% of our ingredients are organic. We use local and/or ethical suppliers as far as possible (genuinely). We encourage others to reduce energy consumption and waste. We do as many of these things as we can all of the time, not just at festivals. Any money we take is used to: pay travel expenses; pay crew; maintain kit; buy stock; improve our service and sustainability; contribute towards events we are a part of; and contribute towards charities/campaigns that we believe in. Some of us do a lot of unpaid work, just for the love of it. We bank with the Co-op Bank (that's not so great anymore... but we have no savings anyway). Our website is hosted by Green ISP (solar-powered, carbon neutral, ethical, not-for-profit company). We buy Fairtrade when we can; our coffee, chocolate, sugar, tea are always Fairtrade. We don't discriminate on the grounds of race, culture, religion, gender/identity or ability/disability. We aim to work as co-operatively as we can and to take turns at washing up, cooking, cleaning, making tea, entertaining, putting up marquees, digging ditches, lighting fires and so on... although we also try to play to individuals' strengths and preferences where possible and fair. All jobs are seen as equally important.